Mr. Knight was born at Reddings, Gloucestershire, 1846. At the age of 25 years he dedicated himself to the service of the Lord. At once he became attached to the Reddings church. While occupying positions of Junior Circuit Steward, School Superintendent and Trust Secretary, he has also been Society Steward at Reddings for several years. His membership at this Church covers 36 years; he has not been a rolling stone gathering no moss and of little service to his Society: he has rendered it great service and has been rock-like in his stability. His soul has been richly fed by the Church, but brother Knight is no mere parasite, for he, according to his ability, has fed his church. Verily, he is “steadfast and unmovable, always abounding in the work of the Lord.” To him, stewardship brings not only honour but duties, too; and he discharges them with a thorough-going conscientiousness. His church has witnessed periods of much prosperity, it has not been without its shadows, but, like a true Knight of the Cross, our brother has ever been loyal to his Saviour, and to his church, and done his utmost to promote the interests of the Cause. He is ever at his post, and is a most regular attender at the services. He is greatly interested in the centenary, and devoutly hopes that it will be a success in all respects. Mr. Knight entertains a very high opinion of the Connexional literature, and the writer has heard him proclaim its merits before his Society, and plead for a substantial increase in the circulation of the magazines. For his fine character and loyalty to his church our brother is highly respected, not only by his Society and Circuit (which he has represented at the District Meeting), but by all who know him. We sincerely hope that the Divine benediction may continue to richly rest upon him, and that he may be spared to give many years of service to his church. Timothy was born in 1846 at East Dean, Gloucestershire, to parents William and Sarah. William was a collier. Timothy was baptised on 31 March 1850 at Ruardean, Gloucestershire. Timothy worked as a sawyer in a coal mine. Census records suggest he spent some time in America around the time of the 1881 census. Timothy married Sarah Jane Taylor (abt1855-1890) in the spring of 1873 in the Westbury on Severn Registration District, Gloucestershire. Census returns identify one child. Timothy married Charlotte Hatton, nee Taylor (abt 1846-1914) in early 1892 in the Westbury on Severn Registration District, Gloucestershire. Charlotte was the sister of Sarah Jane. 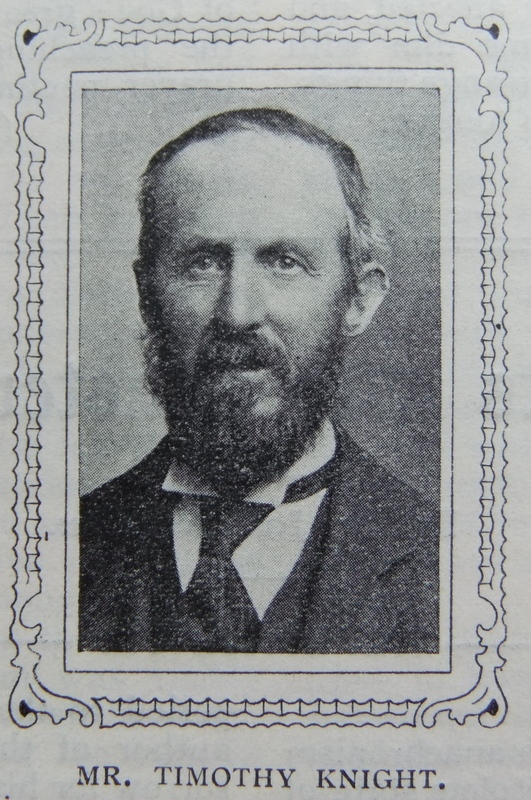 Timothy died in May 1916 at Swansea, Glamorgan, where his son lived.